The rear garden of a modern family home in one of Kent’s picturesque towns was so bare and bleak that the owner actually refused to go into it for the first two years. The site is L shaped, with borders on the boundary, wrapping round the house and with a number of trees carrying Preservation Orders which meant that the new design had to incorporate them. The soil is typical of that associated with new-build: heavy clay subsoil, rubble strewn and covered with a thin layer of topsoil which encourages hope and then dashes it mercilessly as the new plants fail to thrive. 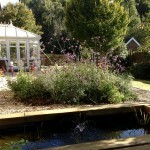 The brief was to create a garden which looks as good from the house windows as it does when the owners are outside. The conservatory overlooks the garden and the owner spends much of her time there. After detailed discussion about inspirations and plant choices, we agreed on a Nantucket-themed garden which references the owner’s US origins and her deep love of flowers. The first thing to do was move the summerhouse to the far end of the garden, and then paint it and the other garden shed in a warm grey with white detailing, a treatment often seen in coastal USA. 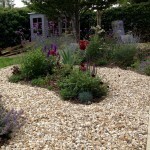 A large area of the lawn was levelled and covered in a thick layer of warm coloured gravel into which I cut beds reminiscent of the shapes found in a paisley shawl. 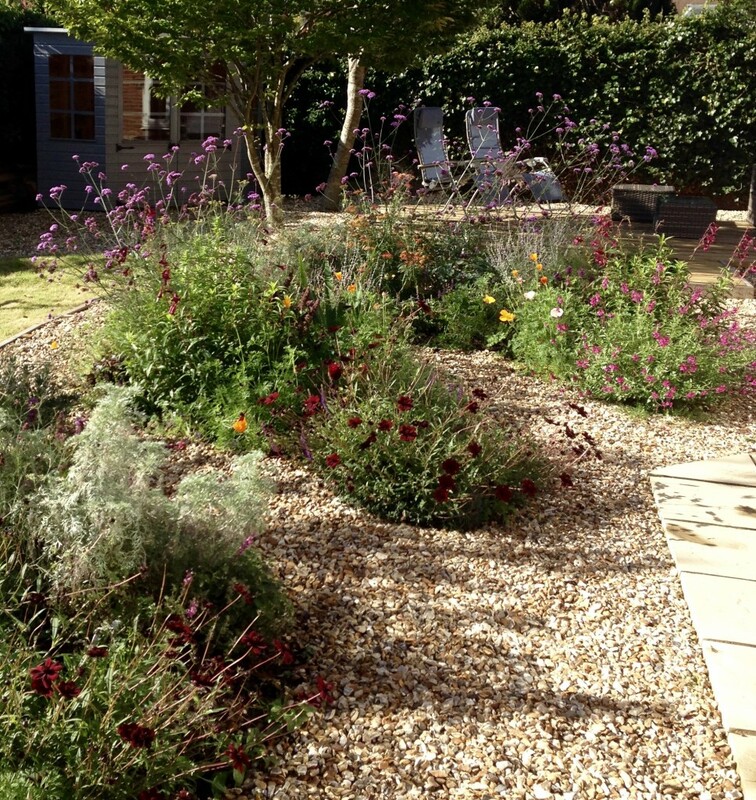 These were planted with roses, perennials and a few grasses to bring colour, fragrance and movement close up to the house, and allow the owner to spend time with the flowers even when it is wet under foot. 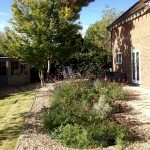 The boundary borders were widened, the soil improved and planted with new roses to climb the brick walls. 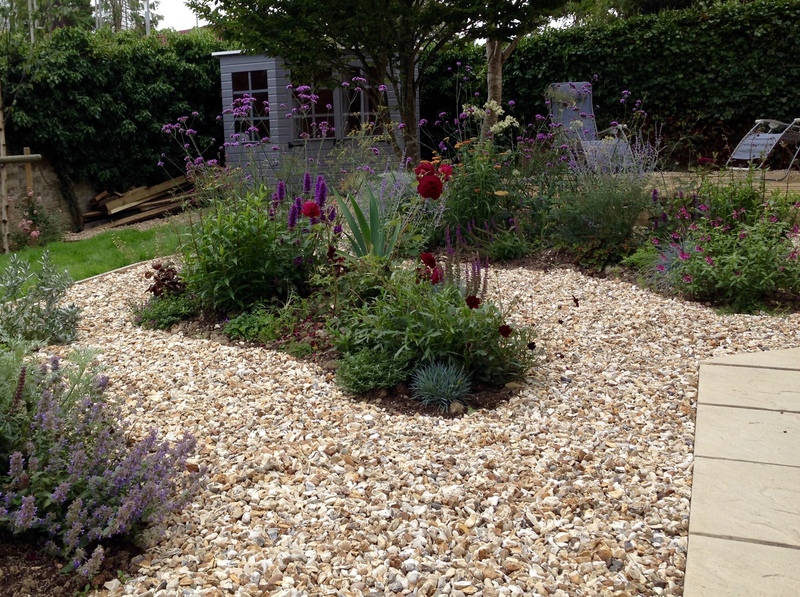 Further perennials will be added over time. Finally, a new timber deck was constructed at the end, which contains a rectangular pool and fountain, and the owner now has a new place where she can sit and enjoy her private garden space.